Welcome to Pine Township, Lycoming County, PA! Pine Township is a beautiful, rural municipality located in the plateau region of North Central Pennsylvania. Our primary north-south highway is PA Route 287, which runs from the Borough of Jersey Shore, north through Pine Township, through Wellsboro to within 6 miles of the New York State Border. Recreational opportunities abound in Pine Township, from downhill and crosscountry skiing, biking, hiking, hunting and fishing. 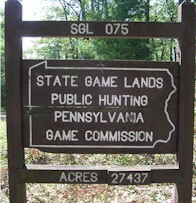 Pine Township is also home to State Gamelands 75, at 27,437 acres, it is the largest tract of State Gamelands in Pennsylvania.